I have been trying to keep my hands busy these days. For me, knitting is a great way to do that. 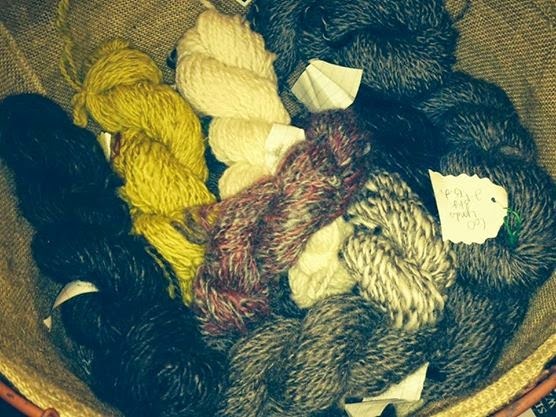 A basket full of imperfect hand spun yarn, just waiting to be used. I figured if I wait until I have the perfect hand spun yarn, I will never knit anything!! My first completed Sheep to product, was a hat for Mike! He has patiently waited for about 17 years for a hat, made from the wool of our sheep. The great thing about making anything handmade for this guy, is the bonus of being treated like you are a GENIUS! He is the most grateful person, I have ever met! I made some headbands for me and the girls, great way to keep those ears warm while doing chores. Again, an easy pattern, I just used two strands of the hand spun yarn, to get effect I wanted. I used a Garter Stitch (10-12 stitches wide) Knitted until they were about 19-20 inches long. Seamed the edges together. 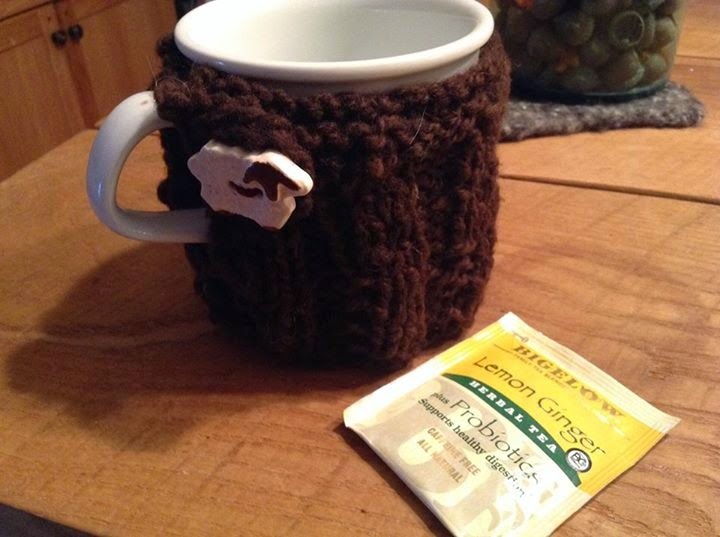 Today, I decided to try a Mug Sweater (mug cozy) I found a pattern that I liked, and altered it a bit to make it work with the cup I was using. I love how it turned out! I was able to finally use some sheep buttons I had stashed away, just waiting for the perfect project to use them for. Last but not least, I wanted to mention that at the Michigan Sheep Breeders Symposium, the photo contest was not the only contest I entered. 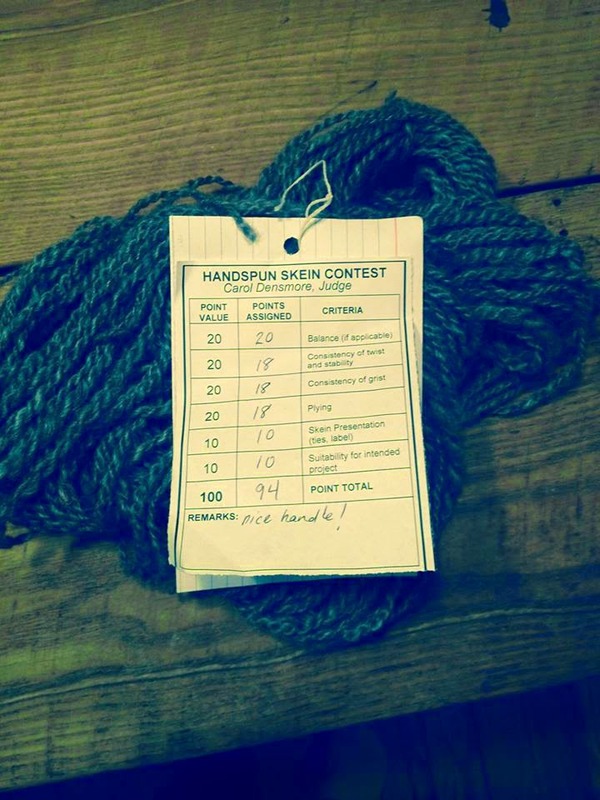 They had a hand spun Yarn contest. I almost chickened out, but Mike wouldn't hear of it and made me bring it along. It was nice to get some feedback on my yarn. I seem to struggle at this time of year, I am glad I have wool to keep me busy! Great looking yarn, Sandra! It's hard to be so cooped up this time of year. I am knitting a baby blanket out of 25 squares, with 5 different colors and 5 different patterns. It is easy, and by the time I am bored with one pattern, I get to change to another one with a different color. 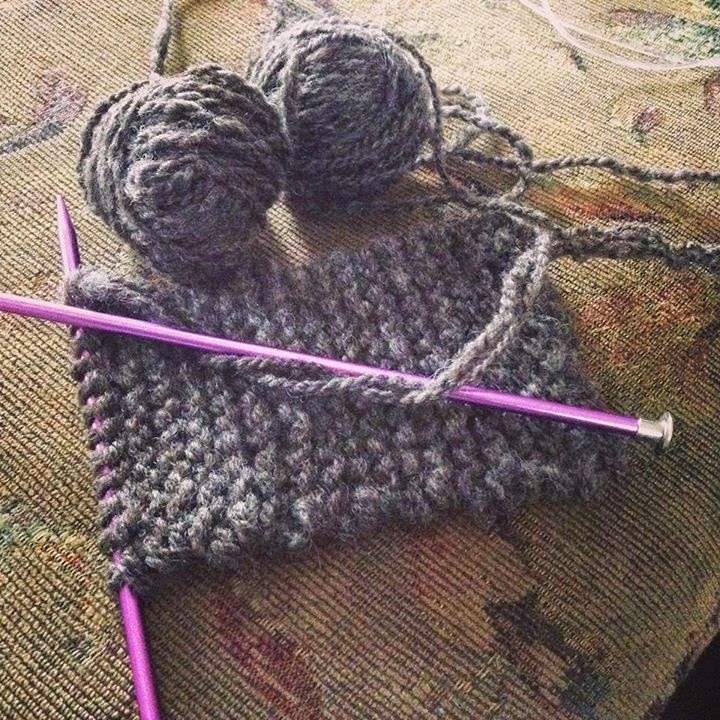 It hasn't taken long to knit up 20 squares. Soon I'll be trying to figure out the way they want it put together. It's fun to make something useful, like your hat and headbands. Thanks for showing us the beautiful dyed yarn. Very creative! Thank you! It has been helpful to keep my hands busy this winter. Your blanket sounds lovely! I'm going to get started on the headbands. I have some mohair/angora that I didn't know what to do with. Thanks. I have not spun any mohair/angora. My daughter has some Angora rabbits, so I will get the opportunity-thanks for visiting!